I still have a small backlog of journal pages that I want to post about before I am up to date. This first one I called “science fiction fan” When I was younger I used to read quite a bit of Sci Fi, when I was at Uni and up until my early thirties. I don’t read it much these days, though I do still enjoy a good sci fi movie. In our art journaling class Zom gave us a prompt to write about some UNUSUAL things that we were into. Sci Fi was one of the things I thought of because it is usually read more by men/boys than women. At least I imagine it is. 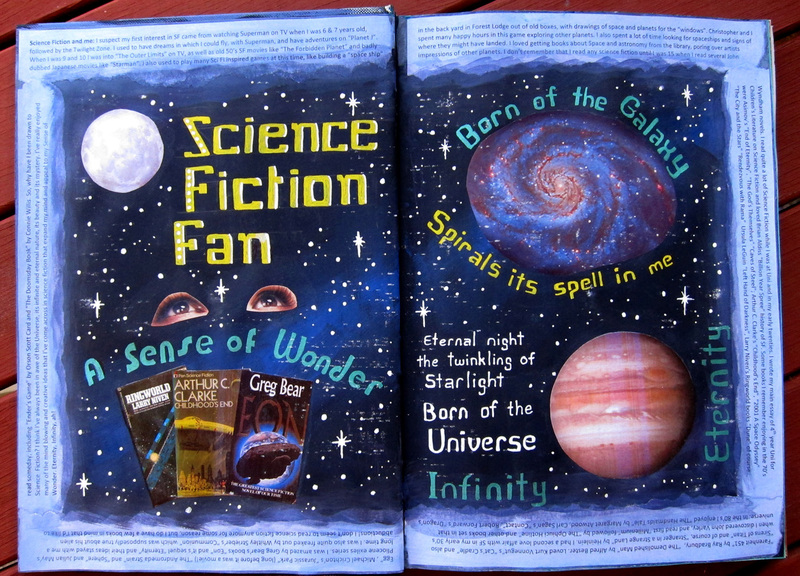 Anyway, her prompt got me thinking and so I ended up writing a piece about my history of being an SF fan starting with watching Superman and The Twilight Zone as a child, and reminiscing about some of the great books I have read. I pasted this little essay around the edges as a border. It seems appropriate that I am using my first ever art journal to answer the question “Who am I?” in myriad ways. But I suppose that is mostly what people are doing in their art journals, exploring aspects of themselves. The reason I chose this one was because I had already created this background, and it looked kind of ancient and seemed to fit. We made the background in the art journaling class in this way: 1. we ripped pages from old encyclopedias that had something to do with the prompt ie, what you would like to study, and stuck them down.. I LOVED this background, but I thought it was so beautiful I’d never want to put anything over it! And what would show up on such a busy background anyway!? 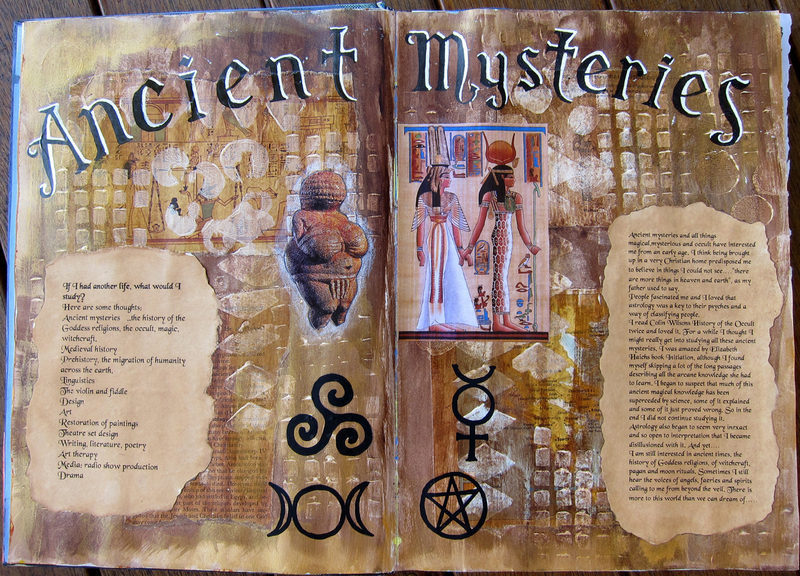 After a couple of weeks I went ahead with the Ancient Mysteries theme and I liked how it turned out. I printed out some writing I did about the topic and made the paper look like old parchment by painting it with a wet tea bag and ripping/burning the edges. This was really lots of FUN. I had a feeling that black and white writing would stand out the best for the heading and I think that worked quite well. Looking at both of these pages it is a little bit like they are school projects, with the big fancy headings and pictures and writing stuck down. I guess that’s Ok, I don’t really mind that. This journal is primarily for me, and I’m happy with these pages, I like the way they look and I got a lot out of the actual process of exploring these parts of me.